With the Olympics being the main contact point with many of the less popular sport, it is easy to get a wrong impression. This was driven home recently when I got to know that there were those in Malta for whom canoeing was the sport of choice. My perception was that this was a sport restricted to rivers and lakes but evidently that is not the case. 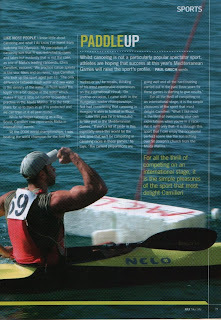 "We practice canoe sprint;" leading canoeist Chris Camilleri patiently explains. "This may be practiced both in the sea, lakes and river." “The only difference between fresh water and sea water is the density of the water. In fresh water the kayak sits a bit deeper in the water and so makes it just a little bit harder to paddle in." Even so, with traffic being a problem not only on the roads but also in the sea, albeit boats then to be more popular then cars there, finding a good enough spot cannot be that easy. Well, not really says Camilleri. "We practice in the Msida Marina. It is the best place for us to train in as it is protected and we can train in it all year round." That hunger for training reveals Camilleri's passion for a sport that he took up as an eleven year-old. "I was a scout and back then we used to compete in the central district canoe races which were a very big tradition in our scout group. I liked it and eventually started practicing the sport competitively." This has led Camilleri to representing Malta in international events. "At the 2006 world championships, I was beating the world champion for the first 50metres or so," he recalls as he thinks of his most memorable experiences. "On another occasion, I came sixth in the Hungarian master championships." Not bad considering that canoeing in Hungary is akin to football i n Brazil. Later this year he is scheduled to take part in the Mediterranean Games. "There's a lot of pride in this especially since this would be the first time that we’ll be competing in canoeing races in these games." "In 2005 I’ve attended to the races in Almeria Spain, as a spectator and the competition was simply awesome!" "The current preparations are going well and all the hard training carried out in the past 3 years for these games is starting to give results." For all the thrill of competing on an international stage, it is the simple pleasures of the sport that delight Camilleri. "What I like most is the thrill of overcoming yourself when you’re in a race. Yet it isn't only that: it is through this sport that I can enjoy the occasional perfect scene like the sun setting over St. Joseph’s church from the Msida marina." This article appeared in the July issue of Skylife magazine.